Hands & Hearts: With Fifteen Words in American Sign Language | What is ML Reading? My first experience with sign language was watching my grandmother and her brother communicate. He lost his hearing at a young age due to a childhood illness. He moved in with my grandparents later in his life. I don’t know when. As long as I can recollect, he was always there. I remember Grandmommy and Uncle Ed’s conversations in the kitchen, living room and dining room. You could always tell if one of them was frustrated with the other. The hands sped up; and when the hands connected for a sign it was a noisy clapping sound. Now that I am older, I can imagine the conversations. “Your five granddaughters are driving me crazy running around the house while the Braves game is on TV.” Uncle Ed was an avid fan. When Hands & Hearts: With Fifteen Words in American Sign Language by Donna Jo Napoli and illustrated by Amy Bates arrived at the library, I immediately thought of Uncle Ed. I rarely interacted with him. I wish I’d tried to learn some sign language, other than finger spelling my name, so I could have developed a relationship with my great uncle. 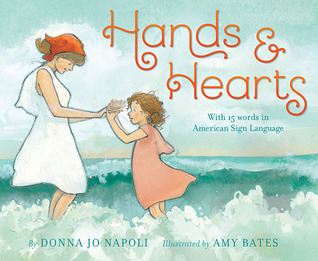 Hands & Hearts is both a beautiful introduction to fifteen words in American Sign Language and a lovely story of a mother and daughter’s day at the beach. Each page spread introduces a word to sign. The clear instructions make it easy to try the signs. Don’t miss the letter at the end of the book written by the author. It explains her interest in sign language and provides a link to an online dictionary for American Sign Language. ML is currently on the way to the beach with her Dad. She spends a week each summer hanging out with her Oregon cousins. It’s been several years since ML and I visited the beach together. I hope she remembers the few times we’ve frolicked at the beach. Nothing is sweeter than watching a mother and daughter explore the beach together. Amy Bates depicts it perfectly in her illustrations. It’s motivated me to make certain ML and I visit the beach this summer. Even if it’s only one overnight. This entry was posted in Picture Book and tagged Amy Bates, Donna Jo Napoli, Hands & Hearts by mlreads. Bookmark the permalink.